We got a peek at the Acura ZDX "concept" yesterday, but now it's been fully unveiled at the New York Auto Show to a crowd of perplexed onlookers. Is it a wagon? An SUV? Yes. 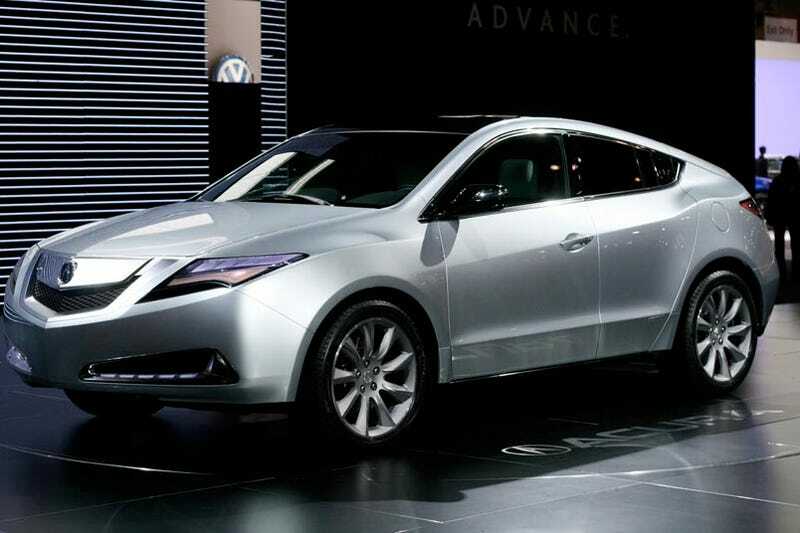 The ZDX is more or less a prototype of the vehicle set to go on sale in the fall as Acura's entry into the segment blurring slice of the market invented by the BMW X6. The wagon SUV fastback ZDX wears fairly familiar Acura styling with the prominently placed power-plenum grille up front, strong shoulder line with blended in fender flairs, and pointy tail lights. The rear glass swoops down in one continuous arc, terminating with a vertical panel for rear visibility. Inside the ZDX gets all the passenger luxuries associated with Acura, including de rigeur leather, matte chrome, cameras everywhere and a high powered sounds system. The ZDX is powered with an unspecified V6 mated to an new 6-speed automatic and driving Acura's Super Handling All-Wheel Drive system. We fully expect this prototype to get a new set of headlights and go to production looking very similar to the prototype. "The ZDX is truly a luxury performance coupe - plus," said Jeff Conrad, vice president of Acura sales. "The emotional coupe styling coupled with a luxurious and dramatic interior and surprising versatility, allows the ZDX to define its own segment and attract an entirely new customer." The ZDX is designed to break new ground for Acura in the areas of provocative styling, contemporary luxury and meticulous refinement. With its sensuous curves, sharply raked roofline and bold fender flares, the ZDX blurs the distinction between coupe, sedan and sport utility vehicle. Clean, flowing lines start from the headlights and run the length of the car, accentuating the cars presence and grace. In keeping with the coupe-inspired styling, the rear door handles are cleverly concealed in the C-pillar. The all-glass tailgate opens wide to reveal a highly functional cargo space with integrated under-floor storage. The prototype is finished off with stylish dual chrome exhaust outlets and 9-spoke machined wheels fitted with 20-inch Michelin tires. The production ZDX will bring a new level of prestige and sophistication when it arrives at Acura dealerships in the fall, offering the latest advancements in performance, technology and safety. The ZDX will deliver sports sedan performance on the road with its powerful V-6 engine mated to an all-new, smooth shifting 6-speed automatic transmission. The potent powertrain will be coupled with Acura's exclusive Super Handling All-Wheel Drive™ (SH-AWD®) system, giving the ZDX outstanding handling and cornering capabilities in all-weather conditions.